Look who's finally branching out! For the Transformers: Age of Extinction toyline, the new Decepticon character Stinger was entirely exclusive to Walmart. Three Legends-class figures, a One-Step Changer, A Construct-Bot, a Funko POP!... and they were all exclusives. There was a Deluxe Class figure available in Japan and a Kre-O set in Taiwan, but those were the only exceptions. Now, thanks to the Studio Series line, he finally breaks out of that rut! Studio Series was announced at this year's Toy Fair, intended to coincide with the standalone Bumblebee movie; the movie's been pushed back from June to December, but the toys are still starting to hit shelves. Since the line is honoring 10 years of movies, the characters are drawn from all over the place. 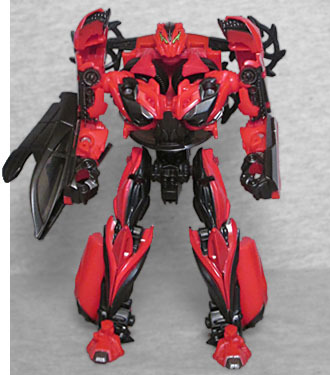 Stinger remains the evil corporate knock-off of Bumblebee, so his body looks appropriately 'Bee-ish. ["Apian" --ed.] I haven't gotten a Bumblebee toy since the first movie (discounting the Human Alliance and Masterpiece versions, since those were both based on the 2007 look anyway), but even considering the design evolution the character has gone through over the course of five films, there is still a recognizable vibe to the sculpt - the shape of the chest, the flares on the knees, the particulars of the feet... it's all very "Bumblebee-ish," even if it's done in red instead of yellow. And yet, it's an entirely new original sculpt. Like many a repaint, Stinger gets a new head. It's round, like Bumblebee's is, but the armor plating on it is more angular, sharper, harsher. He doesn't have friendly round blue eyes, he has two nearly vertical demonic green slashes in his face. Add to that the deep V-shape on his forehead standing in for a knit brow, and he looks angry and vicious. The articulation is average for this size: balljointed head and shoulders, swivel/hinge elbows, balljointed hips, and hinged knees. That isn't a lot, but it's sufficient for a Deluxe Class Transformer. His weaponry includes the blaster he inherited from his source 'bot, though here it's just mounted on his forearm, rather than being formed from the arm like it is in the movie. 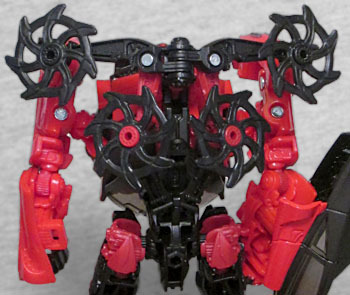 He's also got four hubcap shuriken, which can store on his back or be mounted on a peg on each forearm. Converting Stinger is a little complex, with at least one step I can't recall ever seeing on another Transformer: rather than a hinge to move the front half of the car into robot mode, there's a big swivel joinnt; so rather than having the windshield hanging off his back or something, it ends up completely hidden inside the robot. It's hard to describe without seeing it in person, but it's a nice bit of engineering. 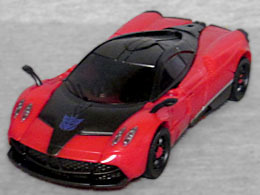 The blaster on his arm unfolding to become the car's roof is also pretty neat, but that one's obvious when you see him - the swivelling chest is a hands-on surprise. 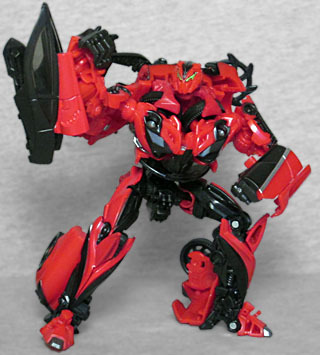 Stinger's altmode in the movie was a Pagani Huayra, but most of you toys have just been repaints of existing toys - even the Takara Movie Advanced Series release was just a red Bumblebee. 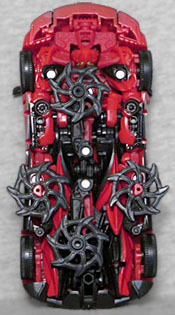 So far the only toys that accurately portray the distinctly unique altmode are the One-Step Changer and this one. The Studio Series figures all include a cardboard backdrop you can display your toy on. Stinger's is a bit of the battle in Hong Kong. I ordered Stinger from Hasbro Toy Shop, because they had a nice coupon code that brought the price down a few dollars - the Studio Series has had its price bumped up a bit, so a Deluxe Class toy like this costs about as much as a Voyager Class would in any other line. Soon after I got him, the line started showing up in stores - amusingly, the first place I saw Stinger? Was Walmart. Way to stay on-brand, buddy! This figure isn't perfect, but it's nice to finally get a version of him that actually has the right altmode and can move.